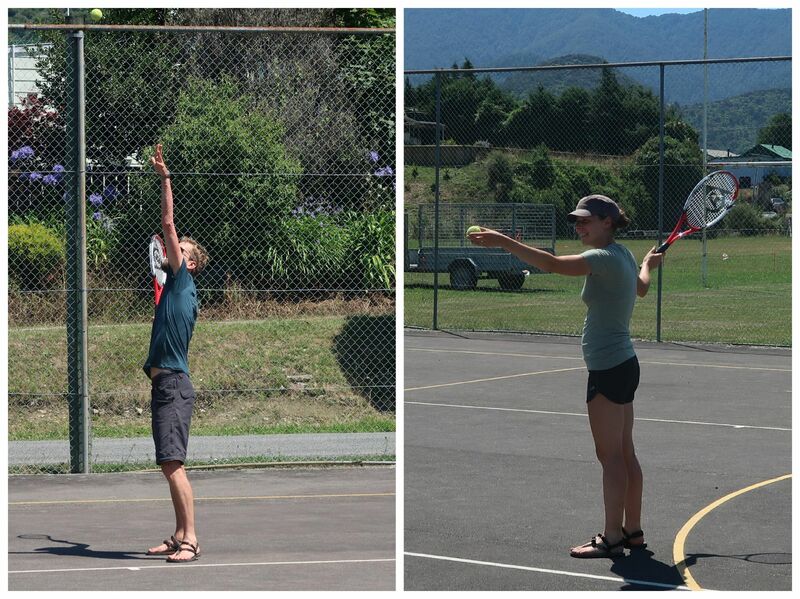 During our rest day in Havelock, we couldn’t resist to play a game of tennis at the tennis court of the campsite. However, it was way to warm to play a serious game of tennis, we quickly took shelter from the sun again. We also packed all of our food into our back. We now have 11 days of food in our backpacks. We don’t know how, but it fits. The only downside is, is that you can’t call us lightweight anymore. We left Havelock early Tuesday morning. We followed the State Highway for several kilometers, before turning right onto a gravel road. Shortly after we arrived at the gravel road, we found out that the road was closed because of tree felling. We were offered a ride in a car to get past the working site. About 1 kilometer down the road, at southern side of the road closure, we were dropped and continued our way. We left the road at Daltons Bridge and followed Daltons Track through the paddocks. We had to carefully look where to place our feet, as covered holes tried to snap our ankles. Furthermore, this track wasn’t very interesting. The final kilometer of the day, we followed a track through a forest section. With the sun burning fiercely today, the trees provided a welcome. We crossed Pelorus Bridge and saw many people swimming in the river below. We continued to the Pelorus Bridge Café, where it was also busy with people. We waited for a while before someone showed up at the office of the campsite. We were given a beautiful and secluded site. After pitching our tent, we went back to the café and treated ourselves with pies and cold soda’s. Wednesday, we left the campsite and road walked about 14 kilometer to the start of the Pelorus River Track. After exactly 3 hours, we arrived at the Pelorus River Track. While we took a short break, two older looking men were dropped by a car. After they introduced themselves, they said they were hiking the Te Araroa. Scott (A.K.A. Shroomer) and his best friend Roman didn’t want to bother with all the road walking from Havelock, so they hitched from Havelock to the start of the Pelorus River Track. We followed the Pelorus River. The track was covered with tree roots and a little rocky at some places, but in general it was easy going. We arrived at Captain Creek Hut around lunch time. After a lunch break of an hour, we continued again. The track climbed to 200 meter. Around 4pm, we arrived at Middy Hut. Shroomer had just arrived before us (for his age, he is 65, he is really fast!). Roman and 2 other hikers arrived shortly after us. Help: the rivers are in flood! During the night, we received a lot of rainfall. When our alarm went off, it was still raining. We eventually left the hut around 9am. Although still raining, it didn’t really matter whether we were wearing our rain gear or not: because of the humidity, we would be drenched anyhow. 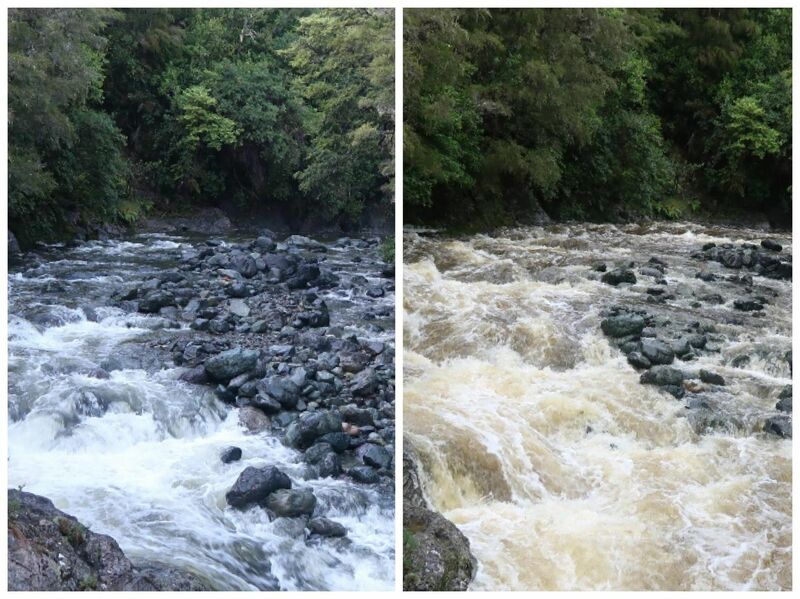 Minutes after we left the hut, we had to cross the Pelorus River. Luckily via a suspension bridge, as the river had turned into a dark brown, fast flowing river. On the other side of the river, the track started its climb to Rocks Hut. According to the signs, this would take us 3 hours. We did it in just under 2 hours. Just before arriving at Rocks Hut, there were 2 streams we had to cross. In normal conditions, one could just step over these streams. With all the rain, the water level has risen. We had to step into the fast flowing water. It was still doable, but just. The water is so strong. Because it was still raining when we arrived at Rocks Hut and there was zero visibility, we decided to call it a day and stay the rest of the day in Rocks Hut. During the night, it rained non-stop. When we left Rocks Hut, it was dry(isch). We again had to cross two streams, but that proved not to be very difficult. We followed the track through the forest to the high point of 1.017 meter. We came through a part of the forest that was recently demolished. Not by humans, but by nature. We saw fallen trees everywhere. The track turned into an obstacle course where we had to climb under and over trees. We continued to the top of the bare mountain. We have had zero visibility up until this point, but as arrived at the summit, the clouds opened up. The descend was easy, except for the parts where the track had turned into a river. We arrived at Browning Hut, where we took a long break. From Browning Hut, we continued down. We came at the junction of a higher water route and low water route. We were curious how the low water route would be after all this rain, and decided to take a look. We had to wade through the river and cross it twice, but at locations where that was still possible. Despite the rain, the low water route was therefore still fine to walk. After we arrived at Hacket Hut, the sun even came out. We really hesitated about what to do. Hacket River, the first major river we had to cross several times would be fine to cross today. If we wanted to continue, we should continue now, Jasper said. However, we know that Hacket River is not the only river we have to cross. With the predicted rain, we were really hesitating what to do. Shroomer decided not to continue, but to go to Nelson. In the end we decided to stay at Hacket Hut and go to Nelson tomorrow. The rivers are still rising! During the night, more rain came down on us. Hacket River had risen about 1 meter. Definitely not a river you would want to cross. With the predicted rain for the next few days, we knew we had made the right choice of not going into the Richmond Ranges. However, because it was still raining, and we were warm and comfortable in Hacket Hut, we decided to stay one more night. Sunday turned out to be a really pleasant day. We crossed Hacket River via the one and only bridge and instead of turning left towards the Richmond Ranges, we turned right. It felt rather strange to walk out of the forest on such a beautiful day. After about an hour we arrived at the Hacket Picnic area. We saw the first day visitors arriving, but as nobody was leaving the picnic area yet, we started to walk down the 12 kilometer long road. After 10 minutes, a car stopped and offered us a ride. This couple was on their way to Abel Tasman National Park, and could drop us in Richmond. When we arrived in Richmond, they changed their plans and drove us all the way to Nelson. Wow! The Kiwi hospitality keeps amazing us, again and again. Once we arrived in Nelson, we first phoned several hostels to ask if we could stay for the night. We were lucky with the third hostel, they had a room available. The remainder of the day, we bought food, went to the i-SITE to discuss what to do in Nelson and how to get from Nelson to St. Arnaud. When that was sorted, we went back to our favorite hobby: eating loads for good food.